It all sound so simple, doesn’t it? So simple that you or I could easily have a go at writing crime fiction ourselves. And if we did, surely it wouldn’t be too long before we, too, had our names in embossed capitals on the front cover of a mass market paperback, our half-lit faces staring moodily out from the back? Of course, as every one of the crime writers at Stirling’s Bloody Scotland crime writing festival (9-11 September) would undoubtedly point out, it’s not quite as easy as that. We’d have to add characterisation, credible dialogue, a dynamic and original plot, and so much more to the mix. All the same, the fact that the first rungs on the traditional crime novel’s ladder are so clearly visible and we’ve all read so many books that have successfully used them can’t help but make so many people contemplate writing one themselves. But are those first, predictable rungs really so inevitable? Are they necessary rules – or just ones that are crying out to be broken? And do the Scottish crime novels that break them gain or lose as a result? 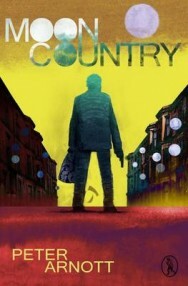 To Glasgow playwright Peter Arnott, the problem with the crime novel is its certainty. Its narrators are usually omniscient; the one in his debut novel, Moon Country (Vagabond Voices, £9.95) most definitely isn’t. We don’t know anything about him, not even his name, or exactly how much he knows about Tommy Hunter, a career criminal who murdered someone in the course of an armed robbery. Hunter has served 14 years for that, and as the book opens, has been released to pick up the pieces of his life and to attempt a reconciliation with his son, daughter and wife, all of whom have hardly heard from him since he went inside. You might think you have heard this story before. Trust me, you haven’t. You are imagining an opening scene in which a small door in a big prison gate swings open and a hunched figure steps out into a cold dawn. Scrub that. Instead, imagine a story that begins with the opening words of Wittgenstein’s Tractatus Logico-Philosophicus and loosely follows its structure, each “beat” or an idea or scene sequentially numbered according to its logical links with the preceding one. A new scene, idea or style (sorry: I should have also mentioned that the story is told using practically every narrative form going) gets a new number. I can’t pretend that it’s always an easy read, but then again, life’s like that. I can’t even pretend that I should be describing it as a crime novel (“Post-crime perhaps?” suggests Arnott when I chat to him about it). What I can say, though, is that it shows – sometimes infuriatingly, often brilliantly – what happens when a playwright’s mind starts toying with just what a crime novel can and can’t do. Why not a play then? “Because it became too big a question. Plays are small things, which is why plays based on short stories work better than ones based on novels. And I wanted to go on a bigger journey than that. He’s right. That’s exactly what you’re left wondering. Because even though the story melts the “hard man” stereotype, that is only the narrator’s interpretation. We don’t really, truly know for sure, because Tommy Hunter “lacks the emotional and linguistic wherewithal to make amends even when he is trying to do the right thing”. We don’t know about Tommy no more than Peter Arnott knows what really happened to that prisoner on Barlinnie rooftop a quarter of a century ago. “Of what we cannot know, we had best be silent,” as Wittgenstein ended his book and Arnott ends his own one (if you want to look it up, it’s on the “beat”, or new idea, that follows 13.12.2.3. In other words – or numbers – 13.13). For Those Who Know The Ending (Mantle, £16.99) the new Glasgow standalone novel by Stornoway wunderkind Malcolm Mackay, actually ends far more conventionally, with three chapters headed ‘1.44am’, ‘1.51am’ and ‘1.54am’. Those who know the ending won’t need any reminding how dramatic it is, but don’t worry, I’m not going to spoil it for the rest of you. 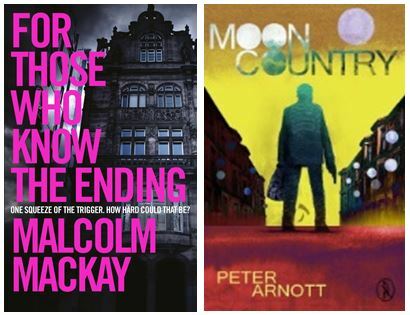 I remember reading about Mackay’s spectacular debut with The Necessary Death of Lewis Winter in 2013, and his triumph at Bloody Scotland 2014 when How A Gunman Says Goodbye won Scottish Crime Book of the Year. It’s taken three years and six books before I got around to reading him, but I’m now firmly, if belatedly, on the bandwagon. Not a single one of his books (I’m now reading his backlist) begins with the corpse-inquest-clues-suspects opening of the traditional crime novel because none of them is concerned with solving crime. Getting away with murder, though, that’s another business. And yes, I do mean that literally. Being a hitman, for Czech gangster Martin Sivok (to be fair, not just a hitman – “beating people, torturing a few and killing some”), who is lying low in Glasgow, is a business – and one that can only work if he can succeed in living a life so spectacularly unspectacular that no-one ever suspects him. Remember that rule the next time you meet someone for the first time who seems reluctant to get to know you. Don’t take it personally. It could just be how a gunman says hello. Malcolm Mackay will be participating in ‘Into The Dark’ on Sunday 11th September at Bloody Scotland; you can browse the Bloody Scotland programme below.